Was born in 1875, and educated at Harrow and Oxford. He studied for the Bar, and spent three years in the Australian gold-fields. He has been twice shipwrecked in the Red Sea, once with the s.s. China, and on the second occasion with the Orotava, the accidents taking place within twenty yards of one another. 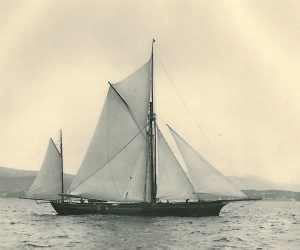 He commenced to interest himself in yachting at the early age of fifteen or sixteen with a racing dinghy. He now owns the Saionara II. Clubs: Royal Thames, Royal Corinthian, Royal London, Royal Harwich, Island Sailing. Residence: 28, Cleveland Gardens, W.